Some Ohio researchers are familiar with FamilySearch’s partnership with the Ohio Genealogical Society to index early Ohio tax records. After countless hundreds of hours of volunteer time, we are seeing the fruits of the labor! The tax records from 1816 – 1838 for Columbiana, Guernsey, Harrison and Jefferson counties are now on the site, fully indexed and linked to the digital image. Later today, I will work up some more screenshots showing how to navigate the site. Meanwhile, enjoy these early Ohio tax records! 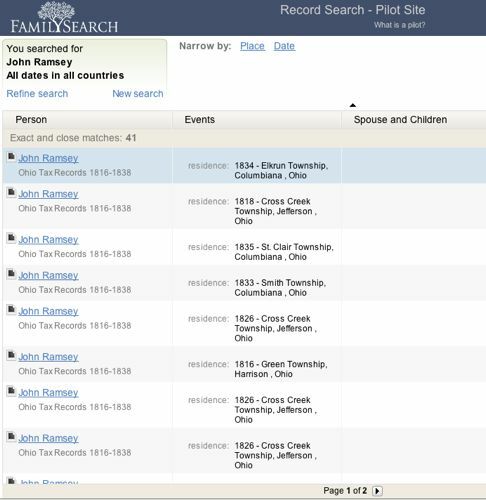 Results for John Ramsey in the Ohio Tax Records on FamilySearch.org. 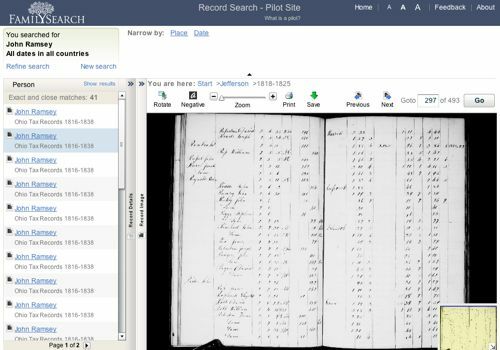 Showing an early Ohio tax record on FamilySearch.org. According to a press release today from FamilySearch, they’ve added to the records (both indices and images) to the pilot FamilySearch site (http://pilot.familysearch.org). For some time, they’ve had all of the images for the 1850 U.S. census (population schedule). Now the everyname index is 83% complete with the recent addition of Louisiana and Wisconsin. The indexed states are Arkansas, California, Connecticut, Delaware, Florida, Illinois, Iowa, Kentucky, Louisiana, Maine, Maryland, Massachusetts, Michigan, Minnesota, New Hampshire, New Jersey, New Mexico, New York, North Carolina, Ohio, Oregon, Pennsylvania, Rhode Island, South Carolina, Tennessee, Texas, Utah, Vermont, Wisconsin and the District of Columbia. They have also added to the available indexes for the 1850 slave schedules. All of the images for the slave schedules are available for browsing, even for the states that aren’t yet indexed. It isn’t just U.S. researchers that are benefitting from FamilySearch’s efforts. Among their international records groups are new church records for Mexico, Norway and Spain. This is such a wonderful time to be a genealogist!